This chapter discusses attempts to involve stakeholders in the co-production of Future Internet (FI) services in a smart city living lab. We outline the experience of five European cities using an open innovation approach to citizens’ engagement in the co-production of smart city services. Recent practice and emergent trends in five urban ecosystems, called ‘Arenas’, are analysed by drawing on the results of detailed case study research. These results are set against ‘good practice’ expectations about how co-production should occur as set out by the European Network of Living Labs as well as in open innovation strategic policies. Based on the case studies, a set of propositions are explored about what needs to be done to build the stakeholder innovation networks required to shape future smart cities. 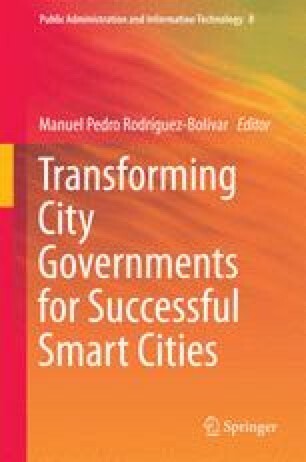 The study suggests that if smart cities are to deliver a better quality of life in more attractive urban areas, new ways of engaging with the stakeholders are necessary to provide them with not just better access and inclusion but also to empower them to act as a catalyst in transforming the dynamics of city services as well. In light of the demands of delivering the FI, cities also need to redefine what they mean when they claim to be a ‘smart’ city and to reconfigure what they take to be the underlying role of stakeholder engagement in service co-production. This work draws on support from the Karlsruhe Institute of Technology, Germany and Manchester Business School, UK. This research was undertaken under the Peripheria project which was co-financed by the European Union, CIP PSP Grant Agreement no. 271015. Special thanks go from the authors to all the project partners and their stakeholders involved in this project for their active role in stakeholder engagement and idea generation. Beamish, E., McDade, D., Mulvenna, M., Martin, S., & Soilemezi, D. (2012). Better together: The TRAIL user participation toolkit for living labs. http://eprints.port.ac.uk/7798/. Accessed 25 Jan 2014. Cohen, B. (2012). The 10 Smartest Cities in Europe. http://www.fastcoexist.com/3024721/the-10-smartest-cities-in-europe. Accessed 12 Feb 2014. EC. (2010a). Europe 2020—Priorities. http://ec.europa.eu/europe2020/priorities/smart-growth/index_en.htm. Accessed 10 Jan 2014. EC. (2010b). Living labs for user-driven open innovation, Directorate General for the Information Society and Media. http://ec.europa.eu/information_society/activities/livinglabs/index_en.htm. Accessed 28 Jan 2014. EC. (2012). Future Internet Assembly, smart city applications and services, May 10–11, Aalborg, Denmark. http://www.future-internet.eu/home/future-internet-assembly/aalborg-may-2012/21-smart-city-applications-and-services.html. Accessed 12 Dec 2013. EC. (2014a). Digital agenda for Europe—about the Future Internet. http://ec.europa.eu/digital-agenda/en/about-future-internet. Accessed 28 Jan 2014. EC. (2014b). Digital agenda for Europe—Open Innovation 2.0: Sustainable economy & society-stability. Jobs. Prosperity, Dublin, Ireland, 20/05–21/05. http://ec.europa.eu/digital-agenda/en/news/open-innovation-2.0-sustainable-economy-society-stability-jobs-prosperity. Accessed 27 Jan 2014. EC. (2014c). Digital Agenda for Europe—Open Innovation 2.0. http://ec.europa.eu/digital-agenda/open-innovation-2. Accessed 10 Jan 2014. EC. (2014d). Digital Agenda for Europe—Open innovation. http://ec.europa.eu/digital-agenda/en/open-and-participative-innovation). Accessed 14 Jan 2014. ENoLL. (2010). European conference on ‘Smart Cities’ as centres for user-driven open innovation. http://www.openlivinglabs.eu/news/%E2%80%98smart-cities%E2%80%99- centres-user-driven-open-innovation. Accessed 1 Dec 2013. ENoLL (n.d.) European Network of Living Labs. http://www.openlivinglabs.eu/aboutus. Accessed 10 Dec 2013. Lemke, M. & Luotonen, O. (2009). Open innovation for future internet-enabled services in “smart” cities. Discussion Paper. Draft 0.2 [Online], Brussels, http://api.ning.com/files/1gRQLp9Fu17mPrrz6zJ7BtRYzcnD8C3njOtUyGdNxpw_/Smartcities.pdf. Accessed May 2014. Linde, P., Peterson, B., & Paskaleva, K. (2012). Stakeholder enlistment in the Peripheria Pilots. Peripheria EU FP7 ICT PSP Project Deliverable 3.1 [Online], www.peripheria.eu. Accessed April 2014. Malmo Stad. (n.d.). Area programme for a socially sustainable Malmo. http://www.malmo.se/Kommun–politik/Sa-arbetar-vi-med./Omradesprogram.html. Accessed April 2014. Marsh, J. (2013). Peripheria—the human smart cities cookbook. www.peripheria.eu. Accessed 12 May 2014. MEDEA. (n.d.). Category archives: Living labs. http://medea.mah.se/category/living-labs. Accessed 12 May 2014. Pallot, M., Trousse, B., Senach, B., & Scapin, D. (2010). Living lab research landscape: From user centred design and user experience towards user cocreation. First European Summer School ‘Living Labs’ 2010. https://hal.inria.fr/inria-00612632/. Paskaleva, K. (2012). The smart city, open innovation and stakeholder engagement, In P. Linde, B. Peterson, & K. Paskaleva (Eds. ), Stakeholder enlistment in the Peripheria Pilots. Peripheria EU FP7 ICT PSP Project Deliverable 3.1 [Online], www.peripheria.eu. Accessed May 2014. Peripheria project. (2010). www.peripheria.eu. Accessed May 2014. Schaffers, H., Komninos, N., Pallot, M., Aguas, M., Almirall, E., Bakici, T., Barroca, J., Carter, D., Corriou, M., & Fernadez, J. (2012). FIREBALL white paper on smart cities as innovation ecosystems sustained by the Future Internet. http://hal.archives-ouvertes.fr/docs/00/76/96/35/PDF/FIREBALL-White-Paper-Final2.pdf. Accessed 12 Nov 2013. Ståhlbröst, A., Lievens, B., Merz, C., & Turkama, P. (2010). APOLLON. Deliverable 1.1 A Catalogue of state-of-the-art concepts, existing tools and lessons learned for crossborder living lab networks [Online]. http://de.scribd.com/doc/39736671/Apollon-A-Catalogue-of-state-of-the-art-concepts-existing-tools-and-lessons-learned-for-crossborder-Living-Lab-networks. Accessed 13 May 2013.